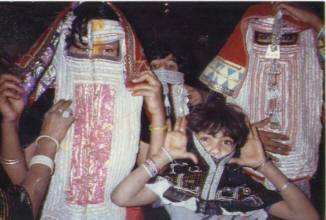 In Kassala, the author stayed with Amara and her two children. "Why are you traveling to Sudan? And why are you without your husband?'' demanded the Egyptian customs official. These two questions illustrated the official Egyptian view of my trip to their neglected neighbor Sudan , the largest country in Africa, with more pyramids than Egypt and a nation of 500 nomadic tribes. I was not prepared for the barrage of zealous officials that preceded boarding of the Lake Nasser steamer from Aswan , Egypt , to Wadi Halfa, Sudan . The steamer is a human zoo and can be an intimidating experience. Scurrying on and off the steamer were clusters of men, bent over with the weight of 200-pound bags of flour, their heads wrapped in bright turbans of lustrous Egyptian cotton. Truckload after truckload of colorful shoes and mats were loaded for Sudan , causing a delay of five hours. One worker fainted, but no one came immediately to his aid. Eventually security officers escorted us through the congested mass of people and to our cabins. We arrived in Wadi Halfa the next morning. Travelers to Sudan must be prepared for countless delays, crowds and bureaucratic red tape. There is also some danger; the United States Department of State warns travelers to avoid Sudan because of the risks of banditry, terrorism (primarily due to the ongoing civil war in the southern regions) and strict curfews, which if violated, can lead to detention by authorities. Despite these problems, I am attracted to Sudan for its people. And even with the anti-Western propaganda espoused by the government, an atmosphere of genuine hospitality and friendliness prevails, surpassing all other Arab countries I have visited. For people traveling on the cheap to Wadi Halfa, there are the Nile and Wadini Hotels. Women and men traveling together have a difficult time finding accommodations. Even married couples who don't have documentation are often refused a hotel room because of the strict moral codes of the Sudanese people. For the more affluent traveler, and for those in a hurry, it's best to fly from Cairo to Khartoum , which offers the Meridien and Hilton hotels and the famous Acropole Hotel. My next destination was Khartoum . We were told that the train, the Khartoum Express, would take three days and two nights to Khartoum from Wadi Halfa. Our trip lasted five days and four nights. Aside from scheduled stops, it came to a screeching halt five times a day for prayer, broke down numerous times, stopped so that desert sand could be shoved off the track, stopped to hunt for lost wagons and occasionally shut down when the conductor felt he needed a nap. I couldn't help but admire the women in my eight-person cabin. I never heard a word of complaint about delays, breakdowns or the general discomfort of the journey. The seats are uncushioned, there's no leg room and you sit knee- to-knee with the passengers facing you. But these travelers seemed unconcerned, even when someone else's feet ended up in their laps! At night two women slept on the floor between the seats and the rest of us managed to contort our bodies into shapes I never thought possible. While I was sitting in the desert during one of the train's breakdowns, decoratively scarred tribal women walked over and greeted me, extending their right arms and touching my left shoulder with their hands, then moving that hand to their hearts. It's the Sudanese national greeting. The hand on the shoulder means I have no weapon; the hand on the heart, I come in peace. They made a fire under a small pot to boil water for tea or coffee to share with me. As the hours passed, the circle of women and children around me grew. Men usually kept their respectful distance. If one decided to come closer to take a better look at the howaja, meaning white person, the women would quickly shoo him away. The desert around the broken-down train started to have the appearance of a refugee camp, as hundreds of people scattered around putting up temporary shelter. Being the only foreigner, I was the center of attention and the source of much amusement, especially when the women discovered hair on my legs. Arab women remove all body hairs with a paste made of lemon water and sugar. Finally we rolled into the Khartoum station and the people, lulled into a stupor by the constant lurching of the train, came alive with laughter and singing. To everyone's amazement, we were told that we couldn't leave the train because it was past curfew time. Curfew starts at 11 p.m. and ends at 4 a.m. It was 11:10 p.m. The British left their mark on Khartoum by laying the streets out in the shape of the British flag. General Gordon's palace today is the People's Palace. In Khartoum , office work stops and shops close at prayer time, and the limited number of broadcast channels on radio and TV make sure that the people never forget the importance of Sharia (Islamic law) and general Islamic practices. For non-Muslims, it can be a suffocating environment. On the other hand, Islam unites people across class lines. 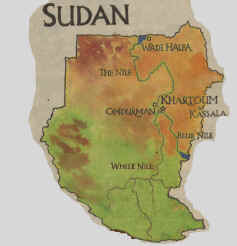 Sudan has been burdened with political turmoil and economic chaos throughout history. It's a country said "to change presidents and governments every Friday after prayers,'' according to a ticket agent for Sudan Airways who didn't want his name revealed. "I do not make any decisions between Fridays and Sundays, because if there is a new government, there will be new laws and rules to follow,'' said the ticket agent with a shrug of his shoulders. Problems, however large, seem to be taken in stride by the Sudanese. Sudan 's present government came to power in a June 1989 military coup headed by 45-year old Lt. Gen. Omar Hassan Ahmed al-Bashir. The government is still in the process of transformation. Sharia has been established as the code for public and private life. Practices which are seen as non-Islamic have been eliminated. For instance, under the new Public Morality Act, women's clothes must be loose-fitting, not similar to men's clothing and must cover the whole body. As a foreigner, you are exempt from the Islamic dress called hijab, but you are expected to cover up. All alcohol is banned. The law states that any person who drinks alcohol or gains possession of alcohol shall be flogged 40 lashes. Foreigners are not exempt from this. Leaving the train when curfew finally ended, exhausted from sitting up four nights without any real sleep, I collapsed on the desk of the El Sawahali Hotel in downtown Khartoum begging for a room. But first, the manager had to pause for his daily prayer. Eventually, water was found, buckets were carried up four flights of stairs, food was prepared and extra sheets were brought to use as blankets. I was touched by the concern of my hosts. In Sudan today, war, famine and natural disasters have played a role in displacing hundreds of thousands of Sudanese residents from the south to the national capital of Khartoum . The majority of these are boys between the ages of 8 and 16. They roam the streets of Khartoum in packs during the day and in the afternoon gather around the mosque where they wait patiently for trucks of food to appear. The phenomenon of street children is a problem to be found everywhere in the world, but the people of Khartoum cared for the children as best they could. The suggested solution by the new government is to round them up and put them into military service or similar institutions. The city itself looked distressed with unremoved debris from buildings destroyed during the June 1989 coup. It was especially desolate and eerie at night after curfew. The general street life of a typical Arab city was absent. Every country in the world open to foreigners likes to pride itself on its hospitality, but in Sudan it's for real. You will never be asked for a tip (baksheesh, which is nothing but a petty bribe) as in other Arab countries where hustling is an art. If you are looking for beauty, it's not in the temples or museums of Khartoum but in the people's disarming kindness towards strangers. My eight days in Khartoum were occupied from 7 a.m. until the late afternoon at the Alien and Security office were I had to register and apply for travel permits. This involved numerous pieces of paper to be filled out, stamped, certified and photocopied. Each paper requires a passport photo. Travelers are not allowed to leave Khartoum or Sudan without travel permits. This means sitting in ill-lighted offices with other worn-out foreigners clutching their papers, outnumbered by bored-looking officials who will demand a pen from you, use it to sign your permits and keep it. I brought 25 pens, and left Sudan with one. A year after the gulf war, Sudan is still paying a high price for backing Iraq . The average citizens have been hard hit by their government's choice, particularly the large number of merchants whose livelihood depends on the trade routes established by their ancestors and which are now closed to them. It's no wonder the Sudanese are uncertain whether Allah laughed or cried when he created Sudan , as an age-old proverb says. In spite of its negative aspects, Sudan is an adventurous, fascinating and extremely safe place to visit. Because of its checkered political history and lack of conveniences, travelers have been kept away from this unexplored country. The only paved road in Sudan runs between Khartoum and Port Sudan , via Wad Medani, Gedaref and Kassala (in Eastern Sudan close to the Ethiopian border). The traveler can ride one of the luxury buses that has windows, air-conditioning and shock absorbers. The trip takes eight to 10 hours. Kassala lies on the Sudanese-Eritrean border. The city is famous for its jebels, cone-shaped hills and a variety of fruits, including oranges, grapefruits, dates, pomegranates and melons. The main tribes in the area are the Hadendowa, Beni Amir, Shukriyya, Halanga and the Reshaida. I stayed at the Noor Palace Hotel. 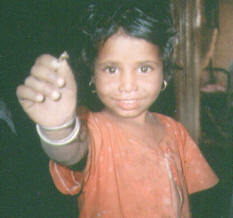 The Reshaida tribe came to Sudan from the Arabian Peninsula about 150 years ago by ship with their camels and goats. Today, they are still unwelcome guests living in Kassala and areas of Iraq and Ethiopia . They are known for their silver jewelry and for breeding the best racing camels. 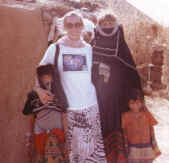 In Kassala I befriended Amara, who took me to her village where I lived among the Reshaida for five days. The 20th century has not intruded inside the Reshaida's tents. Colorful mats and thick tapestries covered parts of the sand floor. But outside, the camels were parked next to their trucks. The men spend their days with the animals, while the women take care of the finances. Each has her own hiding place for her jewelry and money (usually underground). The traveler today may wish to travel to far-away Kassala or make a day trip to Khartoum 's sister city Omdurman across the two Niles . It's the old part of Khartoum with mud-brick buildings and narrow streets. For the mad shopper, Omdurman 's Souk is the largest market in Sudan . You can watch craftspeople carving ebony and ivory, goldsmiths and silversmiths shaping glimmering bits of metal. The Souk is a meeting place for people from all over the country selling and trading their local crafts. It's a fascinating place to wander through, to see the people from widely scattered cultures of Africa displaying exotic customs, from richly embroidered veils to highly varied facial scars and intricate body decoration focusing on the hands and feet. The market in Omdurman is known to have the largest selection of camels in the world, and whirling dervishes perform their ritual dances at Hamad En Nil Cemetery every Friday. I returned to Khartoum with only two days left on my visa and went to Sudan Airways to book a flight to Wadi Halfa to meet the Lake Nasser steamer back to Aswan . Even after my four weeks traveling in Sudan , I failed to remember that the words "hurry'' and "speed'' do not translate into Sudanese. At the ticket counter I was told that all flights to Wadi Halfa were filled for three weeks and, scrutinizing my travel permits, the ticket agent told me that he couldn't sell me a ticket because I didn't have permission to be back in Khartoum . I did two things I advise travelers not to do: I became hysterical and threatened to come back with an official from the American Embassy. Several hours later I received my ticket. Having reached the Lake Nasser steamer, my traveling companion and I threw ourselves into our first-class cabin and on a berth that still had remnants of meals on it from the previous occupant. I got up to hang my coat on the closet door, and a rat jumped out and disappeared underneath a mass of steel pipes. Pressing myself tightly into the berth, I screamed at my companion to "do something!'' A few minutes later she returned with the burly ship manager followed by a bunch of laughing Sudanese. The manager, trying hard to look serious, demanded to know where the rat went. I pointed to the steel pipes, and he got down on the floor and nodded his head. "You have nothing to worry about; it went to the next cabin, through that hole. If you give me some paper I will block the hole so he doesn't come back,'' he said. It had taken me eight days to get my travel permits in Khartoum . This time I was able to do it in three. I found myself habitually lost in the city, spending hours with a 250-pound taxi driver who tried to convince me that he was the Minister of Health. I wasted another day with a driver who took the scenic route to the Alien office and in the process got lost himself. By the time he found the Alien Office it was closed but, by then, the driver had me convinced he was the Minister of Information.